Do you need a great tool to better manage your team, timelines, deadlines, relevant project’s data for you and for your clients? Here’s how Google Calendar can help you out. Create a calendar for each project – To preserve client privacy I temporarily changed the title of each calendar you see in this first screenshot. The syntax though remains the same, ‘year’ (11=2011, 10=2010, etc.) and then the ‘name of the project’. 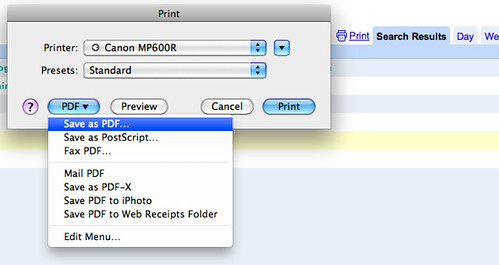 Using a proper syntax helps you to keep your calendar in order and makes them easier to browse/search. Sharing – Share the calendar with the members of your team involved in the project. You can even share calendars with clients if they express the need to monitor the stream of activities and project deadlines. I’ve been in this situation a couple of times. Timeline – By placing the tasks on the calendar you’ll automatically turn each calendar into a detailed project’s timeline. I found the ‘agenda’ view particularly valuable because it gives a clear overview of the upcoming deadlines you have set. Manage client access – Like I said above when I was talking about ‘sharing’, sometimes you can plan to give (or the clients want to have) access to the calendar/timeline. A problem I faced is that in complex projects you might want to create two versions of the calendar. One for the team with the technical details they need/want to edit during the project development, and a second one for the client with all its relevant information (periodic results, deadlines, key data, meetings, etc.). On larger projects you can create dedicated calendars for multiple teams, too. Problem solving – With every project comes a good number of problems, roadblocks or issues. Often these issues are spotted by members of the team while they are taking care of their tasks. What can be done? The member of the team that is facing the problem writes it in the calendar as an ‘all day’ entry adding his/her name next to it. Other members of the team, that can/know how to solve the issue, take care of it or write on the entry tips on how to solve it. Once the problem is solved the entry will be marked as FIXED. If at the end of the day the problem is still not fixed, it can be moved (click & drag) to the next day or to a different date. I know that at first this might not sound easy or natural but I can guarantee you that, once you get into it, it will help you working faster and better with your team. It’s like an open and on-going problem solving channel. Of course, the internal organization of how and who takes care of solving problems can change from company to company and team to team. You can really take this to the next level by enabling your team to add the ‘mobile’ component to it (check the links I shared at the end of this post to learn how to sync these features with your iPhone). Export data (PDF) – Every calendar, search results or specific layouts (day, week, month, 4 days, agenda) are printable and therefore exportable in PDF format. This is really handy when you need a summary of the work you’ve done (you can get it by searching for a specific hashtag related to a project) or for the list of future tasks of your project (printing/PDF the ‘agenda’ layout is what works at best for me). Believe it or not there might still be occasions in which people will ask you for a PDF version of the data. It happened to me with external teams and clients (especially government and public organizations, they often still need something to print out on paper. Well yes they could access it online but… you go and figure that out). What makes Google Calendar a great tool is its simplicity. I’m sure there are many other ways it can be used to help with project management. In this post I shared my tips & suggestions, what about yours? How do you use it? 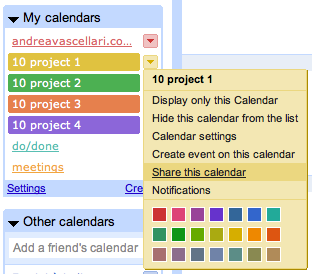 How does Google Calendar help you in better managing your projects? Go ahead and share your experience in the comments here on the blog or via a quick “comment-ready-tweet” @vascellari! Productivity – Google Calendar is more than a simple calendar. Here’s how it works for me. Do/Done list: In this calendar I write what I have to do everyday. What I can’t accomplish in a certain day is moved to the next one or to a different date. At the end of each day I have a list of tasks that I completed and a list of upcoming tasks that I’ll have to take care of in the next days/future. I usually mark the entries in this calendar as ‘all-day’, I don’t set specific time or place. Meetings: In this calendar I save all my meetings – virtual (via Skype, Adobe Connect, Cisco, Google Hangout etc.) and in the real world (face to face). All the entries have detailled information about place (for virtual meetings I mention a specific URL or on which platform they’ll run), time (including the corresponding time for participants that live in other countries. Here’s a handy tool that can help you setup your meeting time) and alarm notifications. 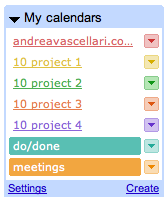 As you probably noticed in the first screen-shot (above) some of my calendars are named as ‘project…’. 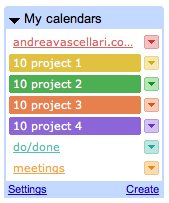 In the next post dedicated to tools I’ll share how you can use Google Calendar to help you with your project management. Stay tuned by subscribing to this RSS feed! How do you use Google Calendar? Share your tips and ideas in the comments or via a quick “comment-ready-tweet” @vascellari! I’m always on the go and I need to have access to my calendar/s from wherever I am and whenever I need it. Instead of calendars I look at them as sets of data related to the projects I’m working on. During the last years I tested a good number of tools but I got the best out of the ‘Google Calendar – iCal –iPhone or iPod touch‘ combo. after you edit one of the calendars (iCal, Google Calendar or iPhone) the changes will reflect in realt-time on all the others. Basically you use ‘one ring to rule them all’. Tip: If you are using an iPhone/iPod and you don’t have wifi/data connection when you are on the go…no worries. Keep updating your calendar and the when you’ll find a connection (or when you’ll plug your iPod/iPhone to your computer > iTunes) your calendar entries will sync automatically! you always have an online backup of all your data. So there’s no problem if you lose your phone or your computer crashes. What appears to be a simple synchronization actually opens up a huge number of new doors on how you can better organize and manage your life, work and projects. Give it a try! Meanwhile… Do you have any related tips you want to share? What advantages you find syncing with the cloud? Questions? Ideas? Special requests? Feel free to share them in the comments or via a quick “comment-ready-tweet” @vascellari!